The XVIII International Federation of Translators (FIT) World Congress closes on August 7 at the Shanghai International Convention Center. 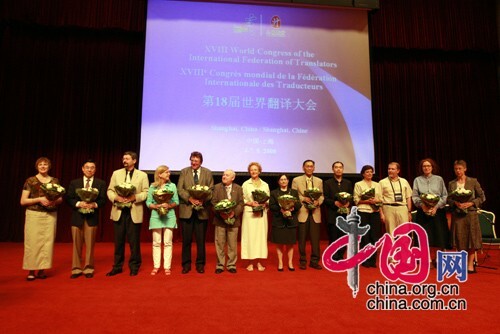 The XVIII International Federation of Translators (FIT) World Congress closed on August 7 at the Shanghai International Convention Center. Outgoing FIT President Peter Krawutschke thanked the congress organizing committee and presented honorary awards to five translators and two translation organizations. 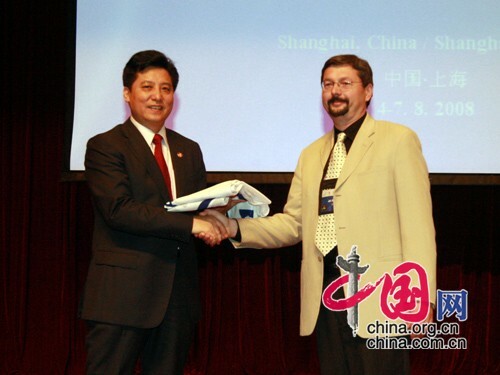 The Translation Association of China (TAC) formally handed the congress flag to the American Translators’ Association who will host the next congress. Marion Boers, newly elected President of FIT, Zhou Mingwei, executive vice president of the China International Publishing Group, Guo Xiaoyong, executive vice chairman of TAC, and Huang Youyi, vice president of FIT and vice chairman of TAC, were also present at the closing ceremony. The congress set new records in terms of attendees and academic papers heard. The theme of Translation and Cultural Diversity provoked lively discussion among the 1500 delegates from 74 countries and regions. Over 400 delegates delivered speeches in 90 seminars, on topics ranging through translation and culture, education, the economy, diplomacy, management and technology. Organizers said the congress was a huge success and will have a far-reaching impact on the international translation industry as well as helping to promote communication and cooperation between people of different countries, regions and cultures. The Translation Association of China (TAC) formally hands the congress flag to the American Translators' Association who will host the next congress.